Our Christmas this year was so wonderful, but I feel a little sad it's come and gone so quickly. Shortly following Thanksgiving I found myself swamped with projects and commitments I was trying to finish all at once while still feeling nauseous everyday. It was beyond overwhelming and stressful and I didn't like how I was feeling inside. So I decided that first week of December that I was going to start saying no to pretty much everything and everyone. What a difference it made for me this year! Though I hate disappointing people, I really just wanted to set an intention to be fully present and enjoy December this year. Every year I try to do this, but I always end up getting caught up in all the commotion. Since we are living in my parents home we didn't need to decorate like we normally do, I completely let go of the need to send out our Christmas card and I didn't bake a single loaf of bread to give to friends. I know what you're thinking, sounds pretty grinchy huh? Maybe, but for us it was exactly what our little family needed. I really wanted to be able to enjoy my family fully and serve others joyfully. I simply let go of a lot of expectations that revolve around this time of year and it felt so good. It made room for more tv fires and hot cocoa with my husband, time with extended family, dancing to Christmas music, helping others and peace of mind. 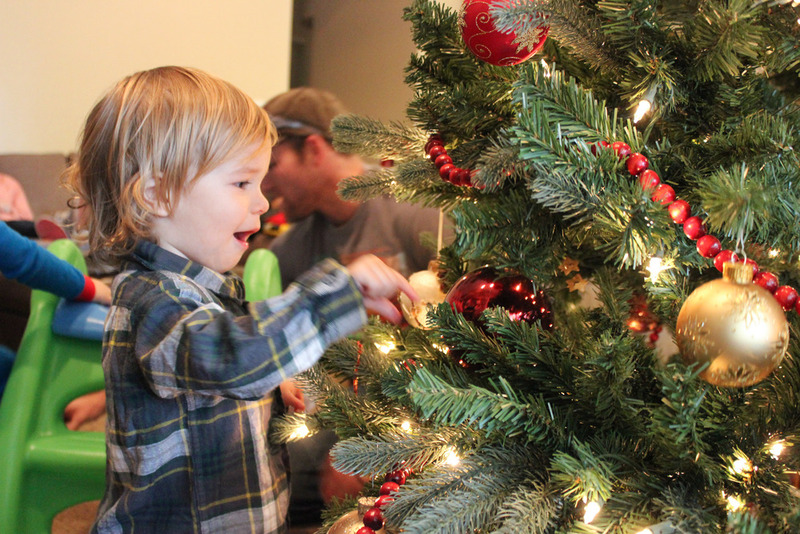 This year especially now that I have a child of my own, I've thought a lot about what I want our family traditions and celebrations to be during Christmas time. I am not talking so much about which kind of cookies we'll leave for Santa as I am about what I want my children to gain from this magical season. I want it to be about Christ, for he is the very reason we celebrate. We kept it simple with gifts, giving him a few new items we thought he would really enjoy. One of them being a new wagon that he's absolutely in love with! It was his second Christmas and even though he's older this year, he still didn't understand everything going on. One thing about me is that I'm a weirdo about the accumulation of things, making holidays hard for me sometimes. Don't get me wrong, gifts are so fun, but sometimes it can feel like way too much. I know not everyone feels the same about this, but for me, I try to avoid unnecessary stuff. Wesley doesn't have a lot of toys and we try to make the ones he does have things that he will be able to play with as he grows. We feel really grateful for family as well, as they gifted him some really thoughtful things- that he adores! December was so good to us and I hope next year is just as peaceful and minimal. A highlight of the month was one night taking Wesley around the culdesacs in our neighborhood to show him the lights while he sat on my lap (he was completely safe, I promise) and "ooed" and "ahhhed" out the window. The excitement at every house was just as huge as the house before and I will remember the joy he had in his eyes forever. It was one of those engrained-in-your-heart moments for me. The second highlight was on Christmas day when I laid with Wesley as he napped on me. He does this everyday, but with it being Christmas, it just felt so special. After a morning of opening gifts we were back to just being together and it hit me that that is what it's really all about. It's about giving of ourselves and being together. It's about love. We hope you all have had a wonderful Holiday, no matter how or what you celebrate! With love from our family to yours.